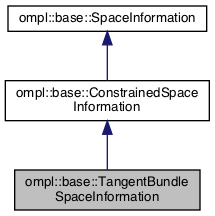 Space information for a tangent bundle-based state space. Implements more direct for getting motion states and checking motion, as the lazy approach requires post-processing. Definition at line 154 of file ConstrainedSpaceInformation.h. Incrementally check if the path between two motions is valid. Also compute the last state that was valid and the time of that state. The time is used to parametrize the motion from s1 to s2, s1 being at t = 0 and s2 being at t = 1. This function assumes s1 is valid. As tangent bundle is lazy, the last valid state is projected onto the manifold. Definition at line 216 of file ConstrainedSpaceInformation.h. Get count states that make up a motion between s1 and s2. Returns the number of states that were added to states. Uses the constrained state space's manifold traversal method to obtain states. Will always allocate states. As tangent bundle is lazy, the states are projected onto the manifold so that they satisfy constraints. Otherwise, fewer states can be returned. Definition at line 177 of file ConstrainedSpaceInformation.h.